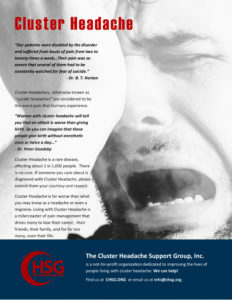 Cluster headache (CH) is a rare and severe syndrome characterized by the recurrence of unilateral pain attacks, of short duration (15–180 min), and associated with ipsilateral cranial autonomic symptoms. Although, not formally included in the International Classification of Headache Disorders, hemiplegic cluster headache (HCH) is an even more rare subtype of CH in which typical attacks can be accompanied by visual, sensory, and/or aphasic migrainous auras that have a variable propensity to evolve in reversible hemi-motor symptoms. The clinical criteria for cluster headache (CH) are included in Chapter 3 of the International Classification of Headache Disorders, 3rd beta edition (ICHD-III). CH may sometimes be secondary to other pathologies.